Every website owner has a lot of questions on the concept of Search Engine Optimization, its methods and tools. There are lots of sources of information on SEO in different languages of the world, however, some people are looking for a quick and easy guide on SEO. Here is an article that summarizes basic concepts and covers some general SEO tips and considerations for your info. Read FAQ about SEO by WorksForWeb. In fact, there are 100’s of sites out there you can bookmark your site at. Please, check out our social bookmarking list and build your own. How to add my site to a social bookmarking site? As an example, let’s add our site to the bookmarks at Google.com. First of all you need to create an account (if you have no account). Ready? Now you are able to store additional bookmarks, tag your bookmarks, and share with anyone interested in your bookmarks. 2. 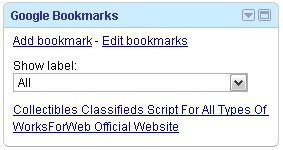 Find “Google Bookmarks” module. 3. Enter the URL, Name and Labels for your site. Name should be appealing for other people who may be interested in the bookmark. Include the keyword phrase into your title as well. 4. Click “Add” button and your site is bookmarked! And remember that now you have one more external link to your site. Congratulations! If you haven’t tried a Bookmarking site, join one, and use it for a few months before you make a judgment on how useful it is. And surely use Share Your Site feature provided with our classifieds software to encourage your visitors to add your site to their bookmarks. 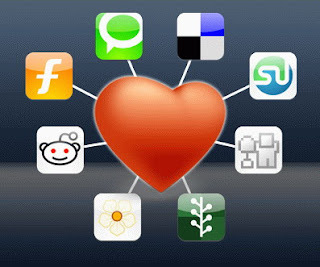 Social bookmarking is an activity performed over a computer network that allows users to save and categorize a personal collection of bookmarks and share them with others. 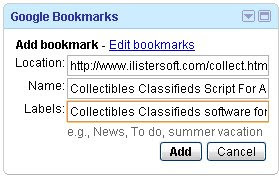 Users may also take bookmarks saved by others and add them to their own collection, as well as to subscribe to the lists of others. It’s a tool for personal knowledge management (Wikipedia.org). In other words, social bookmarking involves saving bookmarks (web addresses) to a public Web site so you can access these bookmarks from any computer connected to the web. Having your site bookmarked in a number of popular social bookmarking sites you drive more traffic to the content at your site. So if you create a piece of content and title it with the keyword phrase you need, you will get a free external link with the required anchor text. If you wish to create your own social bookmarks, you must register with a social bookmarking site. The part that takes the longest is probably setting up an account for each site, which includes email confirmations. But remember, no pain, no gain, right? - regular analysis of how long each link pops up in search engines. At some point you will reach a place where you are no longer drawing significant traffic from your older bookmarks, but that’s OK.
Beware of spamming these sites and making your list of bookmarks appear unattractive or an obvious marketing ploy which will net you very little. The biggest problem with this method is time and the relative effectiveness of the links. You have to make sure the content is good and the title passes spam detection else it will simply be deleted. Don’t abuse this by submitting every page of your site, try to be judicious and think about what pages of your site may be helpful and of interest to other web surfers. 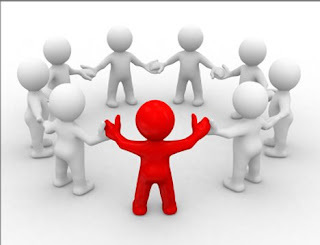 There is an opinion that social bookmarking has limited appeal for a SEO professional. The reason is that you cannot count on it to increase site rankings directly, but indirectly it can increase awareness which may eventually provide additional natural linking. Besides many social bookmarking sites do not allow crawlers to follow links, thus the links do not help the page rank. However social bookmarking is still one of the cheapest and the most effective ways to get sites deep crawled and indexed and attract more visitors. Even if you are not going to base the SEO campaign for your site on this technique it should be in your SEO toolbox of tasks anyway. And don’t’ forget that having great page content accurate meta tags with a solid web design combined with quality links from other pages of similar content contribute best to the end users experience.